This is what I call Death Metal. Where In Flames & Dark Tranquillity (to name just my favorite ones) are no longer playing death metal, Hypocrisy has released a bombastic record to remind you there is a big difference between death metal and melodic death metal (where only aggressive voice have still there place in this name). However, this death metal album is not as good as previous one (Hypocrisy). What was very technical and precise (previous record) has transformed to something more direct and less "arranged". Ok, I know previous Hypocrisyi's record was a bit too "commercial" for Peter Tägtgren and CO, but the magic of Hypocrisy has gone. Some thrashy guitars and aggressive vocals have replaced the previous "technical death metal" record. Due to the fact they have gone in studio "quicker" than expected ? (I have read the studio was free for 3 weeks due to cancellation from another band). Production is very good (logical with Peter!). 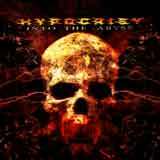 Into The Abyss is not a bad record, but honesty, a bit too "simple" for this band who can do much better. We know it. Just listen to their previous records !! !